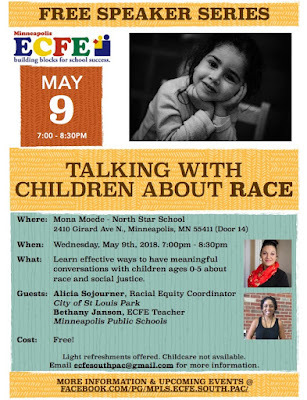 Minneapolis ECFE Parents Council: Free Speaker Event: Talking With Children About Race. Free Speaker Event: Talking With Children About Race. Learn effective ways to have meaningful conversations with children ages 0-5 about race and social justice. Bethany Janson, ECFE Teacher Minneapolis Public Schools. Light refreshments will be available. We look forward to seeing you there! Please RSVP on Facebook.